"It will take you to the edge of suspense." Carol (Anne Archer) is a shy book editor who is set up on a blind date with an attorney (J.T. Walsh). When Carol's date gets an important business call he says they must return to his apartment. After excusing herself to the bathroom, the attorney is confronted in his apartment by two of his clients. One of his clients, a known mobster, says that he knows the attorney has stolen a lot of money from him. Carol opens the door a crack to witness the man murdering her date. After the murder, Carol flees to a remote cabin in the Canadian mountains where she plans to hide until she is out of danger. However, Los Angeles District Attorney Robert Caulfield (Gene Hackman) discovers that Carol is a witness when her fingerprints are located at the crime scene. Caulfield and a Los Angeles Police Department Detective find Carol in Canada in an attempt to get her to testify in court against the mob boss. Although Carol is unwilling to testify, Caulfield and Carol learn that the mobsters have also tracked Carol to the cabin. The mobsters arrive and start shooting at her cabin. The detective, Caulfield and Carol attempt to escape the cabin and the detective is killed in the process. Caulfield and Carol flee by car down the side of a mountain with the mobsters close behind in a helicopter. Caulfield and Carol reach a train station and quickly board a train to Vancouver in an attempt to escape the two hit men who have been sent to find Carol and silence her. While on the train, they discover that Carol's pursuers are on board with them. The train ride then turns into a deadly one in which Carol and Caulfield must fight for their lives and learn to detect friend from foe. 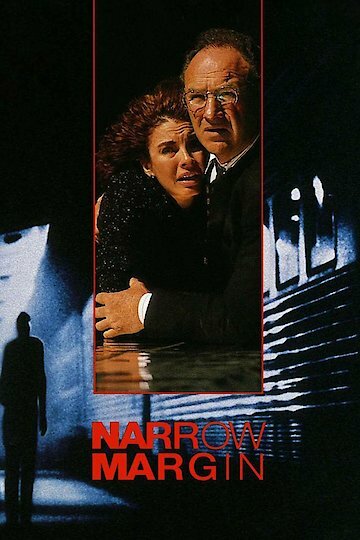 Narrow Margin is currently available to watch and stream, buy on demand at Amazon, Vudu, iTunes online.